Area: 8 sq km. Location: Located just west of the head of the Murtle River, which drains into Murtle Lake. 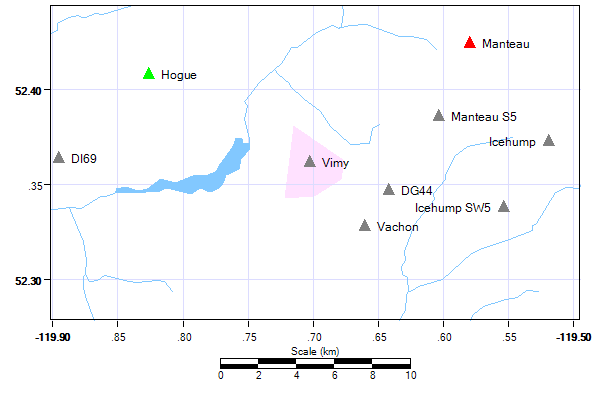 A multi summitted ridge located directy W of Vimy Lakes which are 2 lakes on the northmost fork of Crowley Creek. Terrain: This is a relatively gentle area. History: Named to commemorate the Battle of Vimy Ridge in World War I. During the battle, on Easter Monday, 1917, four divisions of the Canadian Army took the ridge which at that time was the most heavily fortified German position on the western front. The French and British both tried to take it but failed with tragic circumstances, with the French losing 150 000 men. The Canadians went over the top at dawn and captured the ridge by noon. For the Canadian Army this was one of their most well respected and proudest achievments and a decisive battle in the War.